Sensex hits new height 21513 – What Next? 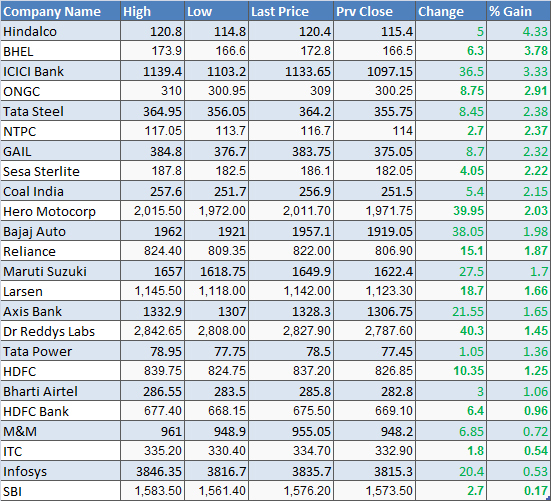 Home » Stock Market » Sensex hits new height 21513 – What Next? Just before election sensex hits new height of 21,525. Thanks to FII Indian market made two new records. Fresh Intra day high of 21,275 and all-time closing high of 21,513 up by 1.11% (237.01 points). Nifty closed the day at 61,401 up by 1.15 %( 72.50 points). Why Sensex hits new Height? Unexpected capital inflows by FII. FII is showing interest in Indian market. FII started purchasing stock in bulk since Wednesday. FII bought stock worth Rs.737.29 Cr on wednesday while DII sold stocks worth Rs.201.85 Cr. India’s current account deficit narrowed to $4.2 billion in October-December 2013 as against $5.2 billion a quarter ago. The current account deficit has narrowed from 6.5 per cent of GDP in October-December 2012 to just 0.9 per cent a year later. We have seen that rupee value is appreciated from 62 Rs/- to 61.29 Rs/- in last one week. This value appreciation is one of the indication that economy is improving. Russia has called back their force from Ukraine and which cause major relief to world from war. Indian market got boost from this news. What next? Sensex rally will continue in future? Answer of this question is quite simple. Indian market is driven by economic condition and FII. If market sees positive economic boost and FII continues to pump money in market this rally will continue. Another important factor which will decide direction of market is 16th Lok Sabha General Elections. Economic Stability is another factor which investors see before participating in stock market. Let’s Hope for the best and stay invested in Stock market. Tags: sensex hits new heights, sensex new record, sensex rally, sensex what next?